NOTE: Dorman (along with CIEN see here) is one of the latest breakouts from my Technical SetUps WatchList which is emailed out each market morning at 8AM in my Stock WatchList Morning Update. Learn more here. This holding continued to trade in its uptrend this past week. It remains highly ranked and there are no real technical concerns to note as of Friday’s close. Although I could raise our 1st SUPPORT to the recent low of the trend line ($92.24), I am going to keep it at $91.00 and pick up the coinciding previous highs of the base for additional support. 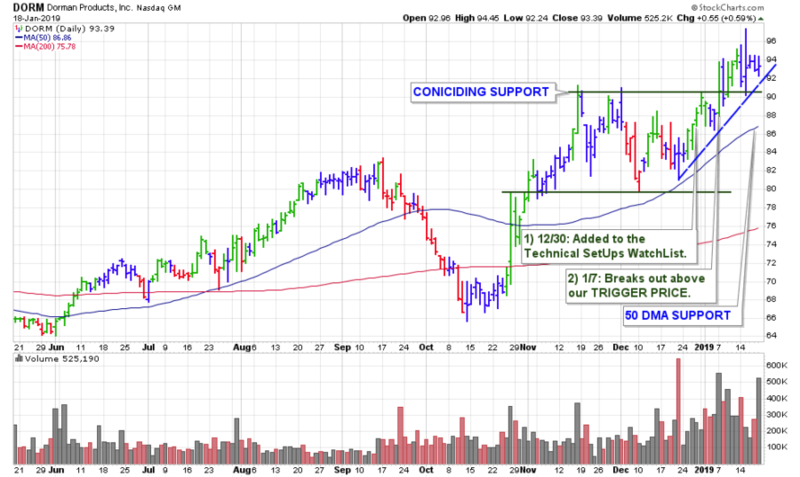 Our 2nd SUPPORT is automatically raised as the stock’s 50-day moving average line advances. Any declines from here, especially with volume, would be the first concern.